When you tell folks that you are going to Canberra – Heart of the Nation – the response will generally be enquiring whether it’s for work or to see friends and family, since obviously it could be for no other rational purpose. But... as you enter the foyer of the gloriously green and sprawling five-star art deco Hyatt Hotel Canberra, and catch a glimpse of the tea lounge, with its buffet table positively laden with gleaming jewels of petit-fours, an abundance of scones, macaroons, hot filo parcels, quiches, sandwiches, cookies and tiny glasses of white and dark chocolate pannacotta - your heart gives a little flutter of afternoon tea delight. Yes, you think to yourself, I Have Arrived! From 2:30 to 5:00pm every day, the impressive array of old favourites and new twists bedecks the centre of the tea lounge. I would recommend booking ahead (I booked on the day and got the very last table) and getting a table indoors so you can have not only the benefit of easy buffet table access, but also the sounds of the grand piano playing just the right jazzy tunes for the occasion. At $45 per person, it may give some pause, however, I like to justify these things by not having lunch or dinner and then amortising the cost over these two meals and then you have a bargain. Indeed, you really need to have a good initial appetite and pace yourself well in order to get to have a taste of all the things that take your fancy. I went with a very good friend, and even with having half a serve each of the things we tried, I doubt we would have got to even 60% of the total selection on offer. 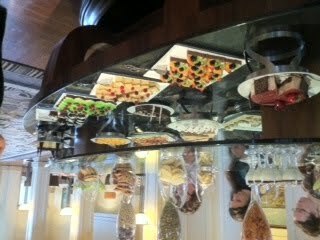 So make sure you do a full lap of the table and employ the appropriate strategy for an afternoon tea of this magnitude. Good coffee and tea is included, as is a glass of sparkling wine. The tea cups and plates are nice with their art deco detail and I couldn’t fault the service. Based on the experience I had, this should be on the list of Canberra attractions right alongside the National Gallery, the National Portrait Gallery, and Parliament House.